Also covering by appointment with travel costs added to removal charge: Tyler, New Harmony, Lindale, Hideaway, Mount Sylvan, Red Spring, Tyler State Park, Callender Lake, Primrose, Edom, Ben Wheeler, Canton, Swan, Whitehouse, Troup, Chandler, Garden Valley, Mineola, Brownsboro, Murchason, and Van, Texas. If you are in need of honeybee removal in an area close to these locations – go ahead and give me a call. If I cannot take care of you, I may know of someone that I can refer you to for assistance. These are beneficial insects that only want pollen & nectar. They will defend themselves with their lives if they feel threatened. Call the hotline number above, and I can evaluate and perform a live removal of the colony. 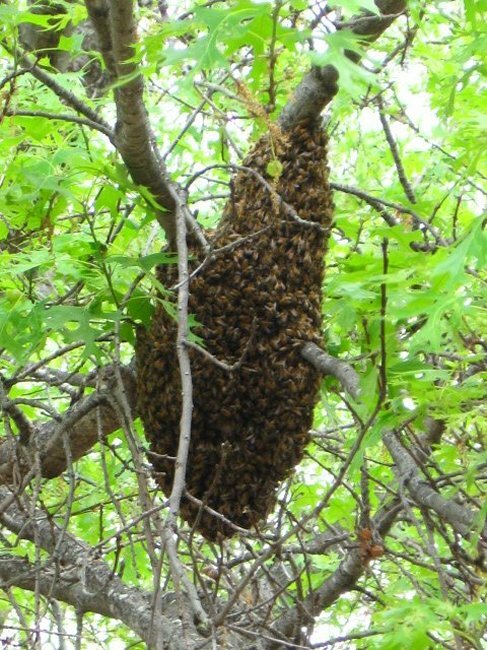 If you have a honeybee colony living in your home, or a swarm that has temporarily taken up residence in your yard or tree, then call the number above, and I can work with you or your contractor remove them for you. 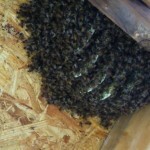 Rex Smith is a Wildlife Removal specialist – specializing in the live removal of honeybees. If you know of utility work with honeybees involved, (i.e. trees being trimmed that have a colony, colony/swarm in a water-meter box, etc), then call my hotline as well, and I can work with the utility company to safely remove the honeybees and re-home them. 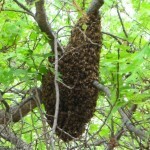 Here is an example of a gathered swarm on a limb . In general, a swarm will emerge from a parent hive, land nearby (usually within a few hundred yards or less) – and rest. While resting, scouts will survey the surrounding area to find an appropriate cavity in which to live. If they find a place, the swarm will be signaled to follow and take up residency within the cavity. Once they have chosen a home, removal is MUCH more time consuming and invasive to the bees and to the space in which they live. “Trap-Outs”, “Cut-Outs”, and higher locations to obtain the bees are charged a fee for the live removal of the honeybees. (note: If a swarm has started building comb, then it is no longer a swarm, but a colony that has established itself. Established colonies take longer time to extract, and are more defensive in nature since they now have a “home” to defend.) (Here’s an example of an established hive with drawn comb) My fee is based on the service of removing a colony from a structure. In all cases, a fee is charged for the removal of the bees, based upon the amount of work to be done, difficulty to reach the hive/comb, distance traveling, and the type of extraction. Removal from a structure can often take in excess of 4-6 hours of labor. People often say “you can have the bees for free – just come get them”. I do not know of any knowledgeable beekeeper that would remove them for free since it is usually a difficult job to salvage the bees in that situation. It would be a lot less expensive for the beekeeper to simply purchase a colony from a commercial beekeeping supply house or to perform “splits” of current hives than to spend the required time, labor, and materials required for removing your bees and hope for success. Therefore, a fee is charged for the labor and service of solving a problem for people who have invasive honeybees – and NEED them removed. Rex Smith retains a permit from the Texas State Entomologist (TAIS – Texas Apiary Inspection Service) for performing honeybee removals from structures and natural areas within the State of Texas. The counties listed above (and several more) are the counties that are specified on the permit. I am a listed contractor / honeybee removal service with Thumbtack.com and a customer has nominated me to be listed with AngiesList.com . Several school districts in Texas have Rex Smith listed as a honeybee removal contact for their IPM Manager. (Integrated Pest Management). 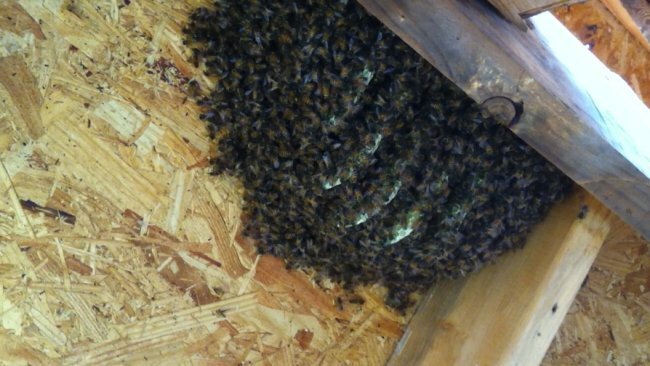 Live honeybee removals provide the lowest level of chemical impact on the environment and in buildings. If honeybees are found on your school property within my work-range, I can work with the city or district’s IPM manager to safely remove the honeybees in a chemical-free manner. I am not an exterminator. I am a beekeeper. Therefore, I do not apply chemicals or poisons, and I will not handle hornets, wasps, or yellowjackets. (“Ground Bees” are actually a type of yellowjacket). Honeybee removal *IS* a taxable service in the State of Texas. 8.25% Texas State Sales Tax is collected for honeybee removals, per rule # 94-157.